With extensive habitat change and increasing recreational fisheries pressures throughout their range, the future of white sturgeon in British Columbia has been called to question. White sturgeon (Acipenser transmontanus) are an ancient and elusive species, and are considered a key part of the cultural identity value of BC waters. Sturgeon can be very large, they may grow up to several meters in length and weigh over 200 lbs. White sturgeon are a popular recreational catch-and-release fishery in the lower reaches of the Fraser. Recent population estimates suggest there may be as many as 34,860 sturgeon within the Lower Fraser River. The trends in population monitoring efforts suggest that certain populations of this species may be in decline. There is growing interest among government, researchers and the general public to better understand this species and its future in our province. White sturgeon form an integral part of the Fraser River food web. As a key predator, sturgeon feed on anything and everything. Juveniles have been known to scavenge through cobbles and sands for snails and other invertebrates. As they grow, sturgeon will begin feeding on larger sources of food, such salmon and eulachon. Sturgeon have several barbels on their snouts, which enable them to find prey by smell rather than sight within the murky water of the Fraser. Sturgeon utilize a diversity of habitat in the Lower Fraser River for spawning, feeding, and overwintering. They naturally spawn during spring freshet and have been documented to utilize deep, fast moving water and course substrate during spawning. Juvenile sturgeon are known to prefer slow to moderate water velocities, while adults are generally found in deep waters adjacent to fast moving water, such as eddies. 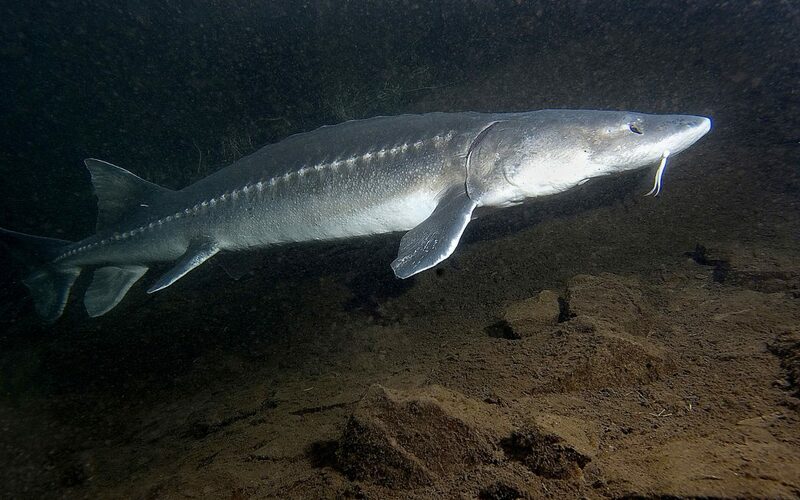 There is increasing concern that sturgeon will not be able to adapt to the rapid pace of human changes on the river, prompting consideration for regulatory changes and increased habitat protection measures. Habitat loss and alteration are considered the predominate threat to populations within the Lower Fraser River. Other threats include loss of riparian habitat due to diking, flood control, and urban sprawl, as well as industrial and agricultural impacts on water quality. Also, declines in prey populations (e.g., salmon, eulachon) and impacts from the recreational catch-and-release fishery are of concern. Currently, populations within the Upper Fraser, Columbia, and Kootenay River are protected under the federal Species at Risk Act (SARA); however, the population below Hells Gate remains unlisted. In 2012, the Committee on the Status of Endangered Wildlife in Canada listed white sturgeon as threatened in the Lower Fraser River, prompting their consideration for listing under SARA. Provincially, sturgeon are considered a red-listed species, which means that this population and their habitat are at risk of being lost.